Are you one sort of a person who pays attention to minute details, handles stress effectively, analyzes things differently, good in communication, able to solve puzzles successfully, strong willed, bold and always right about your sixth sense? Are you physically fit and do you have the power to extract details from the person across you? If you have these factors then you are fit to become a homicide detective. Homicide detective is a person from the law enforcement agency who works on the crime scene with the help of others to determine and establish the cause for homicide. A homicide investigator takes the help from forensic experts to collect and gather evidence from the crime scene which will help and support their claim of investigating the circumstances and nailing the culprit. That is the first and foremost job of the detective. Because this is the place which will eventually give leads and evidences. They do not have flexible or a set of working hours. They need to be available round the clock. They have to be prepared for it. The homicide detective must act fast to gather all the evidence and information regarding the death. He must also ensure that the evidences in the crime scene should not be tampered with. Whatever the scenario of the crime scene upon his arrival or whatever the useful evidences collected must be documented and stored. Because once it is registered, then it can be altered if needed or sent to forensic labs for further investigation. Evidences are to be collected, video and photos of the scene need to be taken, blood samples or any other samples need to be sent to the forensic lab, detailed searches in and around the area to see if more evidence could be gathered are to be made. Finally the crime scene is to be sealed and seen that it is not tampered with, until the case is registered and noted. After all the evidences are studied and some subtle hint is obtained, next comes the information gathering part. A detective needs to collect information from the locals around the crime scene, from relatives and friends and from sources close to the victim. Additional information has to be gathered by sending sources to different locales and networking secretly through reliable sources. As and when you start collaborating on statements made by the sources, slowly and steadily things start falling into place. You gradually start getting clues and leads which ultimately helps you to solve the crime. Sometimes what you have thought of may not be the exact truth. There may be minor points that you have ignored which is actually the major reason for this crime. Discuss your findings with your colleagues. Try changing your thinking perspective to find new angles and twists to the case. It is known that you need to be bold and brave if you have to be a homicide detective. But till the criminal is caught and the case is solved their life is always at risk. And that risk is what they take to catch hold of criminals. When you have inched closer to solving the case or even after the case is solved and the criminal is arrested, you need to gather very strong proofs which will nail the culprit and see that he doesn’t escape the law of justice. So the work of a homicide detective starts from the crime scene and ends when the criminal is put behind bars. Being a homicide detective is no mean task. It is not an easy job also. And you become a homicide investigating officer with hands-on experience and on-site jobs. There are colleges and courses in plenty but finally what counts is how well you fit in the pieces and how your knack for solving mysteries, comes in handy during the investigation. For a person to become a homicide detective, he needs to atleast have done his high school diploma. Some countries demand atleast a bachelor degree in some discipline. For people aspiring to be a homicide investigator, there are courses and degrees in criminal justice and law enforcement. Then there are courses in cyber crime. After a degree it is required that you join a police department of your choice. You cannot straight away be a homicide investigator after attaining a degree. Once you are enrolled in the police department you need to learn jobs about how to file reports, how to go about arresting criminals and aid your superiors in their investigation. After a few years of experience in the police department you can become a homicide investigator. Either you could ask for promotion to the homicide investigation department or you yourself get promoted by merit. If your work and prior services and the method of investigation with good outcomes are appreciated in your department, then you automatically get promoted to the homicide department. 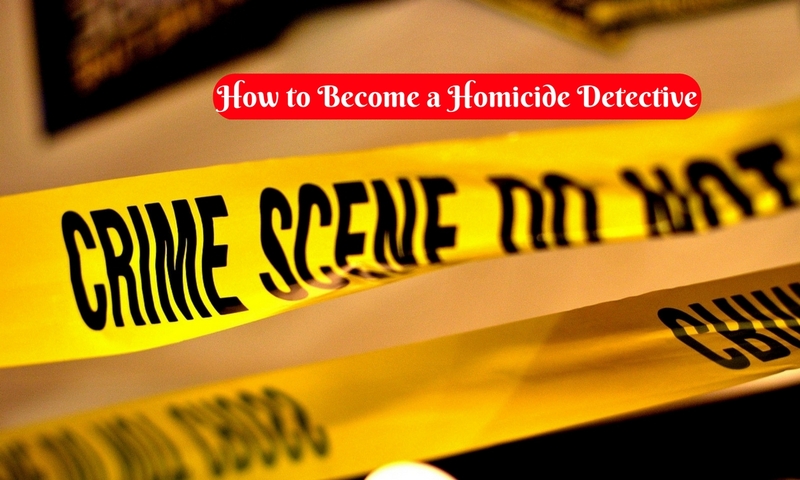 Sometimes joining a homicide department may need that you take certain tests or certification courses specifically required to be a homicide investigator. And as soon as you join, you may have to attend workshops and seminars to upgrade yourself with the functioning of the department as well as understand the nuances of conducting a homicide investigation. There are certification courses which you can take up side-by-side when in your job which will give you better chances and an edge over the rest when you are due for promotion in the homicide department. These certified courses are offered as regular classes or it could even be taken online. Then you have another option of being a private homicide investigator or working as a freelancer. Here all the educational requirements remain the same. You even need about 5 years experience in the police department. Later you can complete certification courses and get a license to become a private investigator. This requires that you have a solid network and trust of people including experience of cases solved successfully. Whether you are joined with the police department or you work independently, once people start appreciating and admiring your work, there is no looking back for cases and its solutions. Homicide detective colleges offer degree or bachelor’s courses related to homicide investigation field like a degree in law enforcement or a degree in criminal justice. There are colleges which offers a master’s degree in very specialized fields and which helps you in being a pro in the method and tactics to be undertaken while solving a case. Here you need to study about the rules and laws pertaining to arrests and criminal offences, firearm and weapon use, physical fitness, investigation techniques, thinking and analysis studies as well as stress management. Even in a bachelor degree for criminal justice you have specializations in digital forensics, emergency management, homeland security, crime scene investigation and behavior analysis. These specializations give you an insight into how you need to deal with situations in your professional life and how it can be implemented during your homicide investigations. As mentioned above you have specialized courses in criminal justice and law enforcement techniques. 1. You have course covering the basic but important aspects like science. Science is generally needed in order to know about chemicals, human body, study in physics like momentum, speed and gravity. 2. Then you have courses which teach you communication skills especially needed when you need to communicate in order to gather information. 3. Courses offered are also on understanding human psychology so as to know what runs in a criminal’s mind and to decipher what he thinks. 4. Then you have the forensic science classes where you study in detail about the type and causes of deaths, blood or DNA analysis, and voice recognitions and firearms investigation. 5. Courses are offered on criminal investigations. Here you learn how to investigate a scene of crime or how do you gather evidences in the place of crime. Then you learn to analyze the crime situation and methodologies which may be used as well as to know what the next step of the criminal would be. 6. Course on law enforcement helps you with criminal law and criminal justice. What are the evidences that can be presented in the court or what are the offenses under which a criminal can be charged, all these come under the law enforcement purview. 1) Why did you opt to be an investigator? 2) How do you effectively control stress? 3) What are your strengths and how do you put it to use while investigating a crime? 4) Give details about your weakness and how do you ensure that it doesn’t hinder your career. 5) How are your communication skills with the other people who help you in crime investigation? 6) How good an observer are you? Cite examples. 7) Tell us about your analytical and recollection skills. 8) How do you manage work flexibility together with holidays and family? 9) What are your future career goals? As simple as it may sound, but these are the questions which are enough to get a fair assessment of you and why you can be made a homicide detective. 1. Salary of a homicide officer in the law enforcement department is fixed and it depends on the number of years of experience you have in this field. On an average, detective officers earn around 75,000- 80,000$ annually. Again it depends on the experience and the position which you are employed in the law enforcement department. 2. If you are a private investigator, then the income what you earn is not fixed and it solely depends on the number of cases you handle on an average per year. There are other factors like the location, your experience and success rate, network with people and how trustworthy people think you are. Then again it depends on what the person hiring you for his work is able to pay you and how complicated the case is. So private investigators start with an annual salary of 40,000$ and can earn above 80,000$ when they become the most sought after investigators. 3. Then there are the investigators who are hired by the investigation firms. These are paid a fixed salary by the firm and their income depends on how reputed the firm is. Such investigators start their average income with less than $40,000 a year and as their experience increases their income also rises. The road to be a homicide investigator is not easy, nor does it become easy when you be one. But then at the end of the day, satisfaction of having brought a criminal behind bars is unmatched and worth all the efforts.